Kamianets-Podilskyi is a massive medieval fortress which is located in the town in western Ukraine located between the towns Khmelnitsky and northwest Chernivtsi, which are only 25 km away. Kamianets-Podilskyi is built like a peninsula surrounded by the river Smotrich, which is a tributary of the Dniester. Kamenets-Podolski Castle, was built to protect the so-called. bridge of the castle which was once the only entrance to the city. 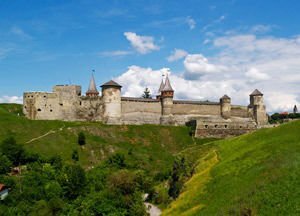 The first part of the name of the fortress and the city comes from the Slavic word "kaminy", which literally means stone. The second word in the composition of the name of the medieval castle comes from the name of the local historic area Podillia. According to some historians in antiquity the site was inhabited by the Dacians, who lived in present-day countries Romania, Moldova and parts of Ukraine itself. Dacian fortifications they were called then, which later were replaced by the fortress Kamianets-Podilskyi, Petridava, which is a combination of the Greek word "Petra" or its Latin inscription that translates to stone, and Dacian word gives the meaning, city. During the reign of King Peter the Great he decided to visit the monarch Kamianets-Podilskyi twice and was impressed by its massive and strong fortifications. One of the towers was used as a prison cell for Ustym Karmeliuk, who was a prominent peasant rebel leader from the beginning of the 19th century. He escaped three times from the tower of Kamianets-Podilskyi. One of the first and most mass killings during the Holocaust began 27th-28th August, 1941 near Kamianets-Podilskyi. In these two days 23, 600 Jews were targeted and killed, most of them Hungarian Jews (14, 000-16, 000) and the rest were local Polish Jews.